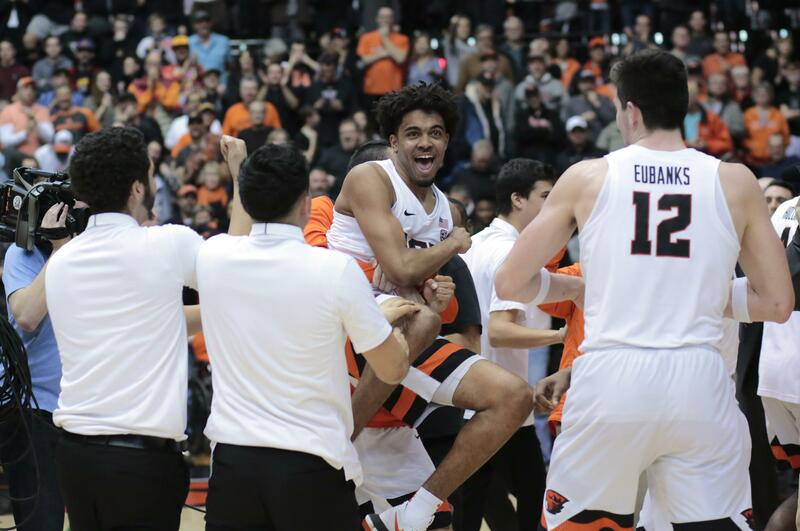 UPDATED: Sat., Feb. 10, 2018, 10:59 p.m.
CORVALLIS – Stephen Thompson Jr. was off target on a floater that could have won the game with seconds left in regulation, then missed two free throws that likely would have sealed the contest in overtime. In double overtime, he didn’t squander a new opportunity. “Third time’s the charm,” said Thompson, who has a well-earned reputation as a clutch shooter. Thompson hit a 3-pointer with 0.3 seconds left in double overtime as Oregon State stormed back to beat Washington 97-94 on Saturday night. The Huskies might have been feeling dij` vu. Nearly two years ago, on Feb. 24, 2016, Thompson drilled a buzzer-beating 3-pointer as the Beavers beat Washington 82-81 at Gill Coliseum. “It just happened to be in the same spot,” Thompson said. Thompson finished with 22 points, four 3-pointers, six assists and a career-high six steals, while Tres Tinkle added 29 points, 11 rebounds and eight assists for the Beavers (13-11, 5-7), who trailed by 13 points with eight minutes and change left in regulation. Drew Eubanks added 18 points, 13 rebounds and four blocks. With Oregon State behind by double digits late in regulation, coach Wayne Tinkle said he challenged his team during a timeout. “Boy did they respond,” he added. Noah Dickerson bullied his way down low to 28 points and 12 rebounds, while Jaylen Nowell added 23 points for the Huskies (17-8, 7-5), who lost both games of their Oregon road trip. “We just didn’t defend the 3-point line. I mean, it’s what we do. We let Thompson get hot, and when those guys get hot and they start getting confident, you see what happens. They make the big one. Tonight, our defense failed us,” Washington coach Mike Hopkins said. Oregon State shot 1 for 7 on 3-pointers in the first half, but made 8 of 12 from distance in the second half and overtimes. The Huskies shot 83 percent from the free-throw line compared to 50 percent for the Beavers, and Thompson missed two from the charity stripe that could have won the game with 3.3 seconds left in the first extra period. “After I missed those free throws, I was starting to get down on myself and my teammates did a great job of picking me up,” Thompson said. In the second overtime, Tinkle put back his missed shot to give the Beavers a 92-90 lead with 1:36 remaining. After a Huskies turnover, Thompson threw an alley-oop pass to Eubanks, who dunked to put the Beavers ahead 94-90. But Matisse Thybulle responded with a 3-pointer with 31 seconds left to trim the margin to 94-93. An Oregon State turnover gave the Huskies the ball, and Dominic Green was fouled on a shot attempt with 10.1 seconds left. His missed the first, but made the second to tie the game at 94, setting the scene for Thompson’s heroics. Washington: Dickerson became the 38th member of the 1,000 point club for the Huskies with a layup early in the first half. He has 1,015 points. Crisp will likely be the next member of the club as he has 964 points. Dickerson, a junior, has heated up lately. In his previous three games, he averaged 20 points and 11.3 rebounds. Oregon State: All of the Beavers losses have been by single digits this season. Seth Berger returned on Saturday after missing Thursday’s game due to concussion protocol, but freshman Alfred Hollins made his second straight start after scoring 19 points and swiping four steals against Washington State. Hollins had 12 points on Saturday. Published: Feb. 10, 2018, 10:22 p.m. Updated: Feb. 10, 2018, 10:59 p.m.